Before entering the tunnel we had driven on the motorway through several miles of highly ordered, semi-urban sprawl. In the distance was Lake Constance with its hazy shores that bring together Austria, Switzerland and Germany, complete with a huge Zeppelin high above, endlessly and slowly making the rounds of the lake’s horizon-spanning breadth. In the foreground we passed a succession of hypermarkets, suburbs, and industrial parks, which didn’t look industrial at all but were rather pristine collections of freshly painted warehouses, tastefully plant-bordered car parks, well-designed service buildings and the occasional clean-cut multi-storey office complex. We left the motorway and immediately entered the tunnel, which was long, and had a continuous radius so that I found myself constantly waiting to see what was around the interminably forthcoming corner, which as it arrived was like being propelled into a parallel universe, constructed entirely from images found in old-fashioned postcards of an impossibly idyllic, rural Austria. As we wound upwards, steeply forested hillsides gave way to velvety, dramatically undulating meadows that stepped back higher and higher in swelling green mounds, peppered here and there with steep-pitch shingled farmhouses which although large structures, looked like small boats adrift on billowing oceans of rolling grass. This is the Bregenzerwald, a large network of valleys home to 30,000 people in a scattering of villages, one of which is my destination, Krumbach. They were difficult to reach for most of their history, leading to the locals speaking “Walderisch”, a dialect with its own distinct vocabulary and grammar, unrecognizable even to people from the other side of the tunnel in Bregenz. The valley’s relative seclusion and tradition of self-reliance, fostered a renowned ingenuity in all aspects of construction, which led to the valley becoming home to the Baroque Master Builders in the 17th and 18th centuries, a guild that exported their skills and expertise around the region, building a whole host of important monasteries and churches that still constitute the core of what is considered “German Baroque”. That paradigmatic international relevance waned, but the importance of the building crafts to local culture never did, with a tradition of home-building and renovation by local craftsmen, and the filling of these buildings with cabinetry and furniture manufactured locally, surviving, and indeed providing the core demand for what is a strong export industry to this day. As we continued driving, the dramatic rolling of the hilly meadows became more sober, with pastures now spreading gently upwards in continuous inclines, and the frequency of farmhouses increasing until groups of them began to collect sporadically alongside the road. It was amongst these clusters of 10 or 20 dwellings that I caught my first glimpse of the series of bus stops designed by internationally renowned architects which I had travelled here to see. Next to a squat workshop building full of half-assembled cabinets was Amateur Architecture Studio’s first permanent building outside China, an articulated box whose walls were made of pale timber columns that shrank towards an aperture-like window at its rear. Further down the road and directly behind the sign announcing one’s arrival in Krumbach, and among the next cluster of houses was Rintala Eggertsson Architects contribution from Norway, what looked like two miniature local barns, shingles and all, stacked on top of each other, and then slightly slid apart so that the top was precariously overhanging. I almost didn’t notice the last stop before I reached the village centre, Alexander Brodsky’s discreet contribution which looks like some sort of alpine lifeguard-tower sheltering a blue picnic bench under its stilts. I had already become acquainted with all of them before I had even known I was coming on this journey, as their images had been widely disseminated in the design media. The collection of wildly diverse statement designs, combined with their almost photoshop-perfect scenic backdrops rendered them ideal of for online consumption, propelling the little village of Krumbach to instant international architectural stardom. A young resident recently returned from living in Liverpool enthusiastically told me that she couldn’t believe how many people like me, from all over the world, she kept bumping into and having a chat with on her daily jog, incredulously asking me “are they so well known, our bus stops?”. The project is a novel idea, perfect for our age of mediated architectural culture, but at the same time they belong to and have emerged from a vigorous regional tradition beginning in the 17th Century, of combining the valley’s very specific strengths in craft, with a profoundly confident and outward looking international reach. From the 1970s a distinctly bottom-up, interdisciplinary school of architecture and craft, the Baukünstler, emerged in the region, and since the early 1990s the Bregenzerwald has hosted a tri-annual international competition aimed at promoting this collection of craftspeople called Handwerk+Form, in which any international designers with the wherewithal can team up with a local craftsman and create a new piece of design. All of these were then showcased in various workshops around the valleys, for a period turning the whole region into a working showroom. This was followed in 1999 by a highly successful association of 80 craftspeople and workshops in the Bregenzerwald village of Andelsbuch called the “Werkraum”, an organisation who’s remit was the marketing, promotion and preservation of local facilities and skills, and whose success has given it wide exposure and a Peter Zumthor designed home that is something of a pilgrimage site for design addicts. These initiatives were in anticipation of, and in response to Austria joining the EU, and in being faced with how to stay competitive in an open market. The resounding response of the Bregenzerwalders was to do what they have always done, but better, in new ways, and to shout about it on an international stage using design and media as vehicles. As Smiljan Radic said to me, “publicity and media is part of architecture right now, the issue is how you relate to it”, and a clever village in the Bregenzerwald has related to it in a sophisticated, fun and multifaceted way. The local-global nature of this relationship was embodied most amusingly when a cameraman from an Austrian broadcaster was filming outside Belgian architects Architecten de Vylder Vinck Taillieu’s design, and a passing farmer stopped to ask if he needed a cow, at which point he took the black & white spotted cow he had in the back of his transport, and manoeuvred it into the black and white angular bus stop, leading to an already legendary slice of footage. Krumbach had previously been more a collection of hamlets than a village, and it has been the Mayor’s plan over his 20-year tenure to form a village centre, a collection of recent and under construction apartment buildings, a supermarket, café, bank, and an impressive new multi-purpose hall with Library, bookable space and music rehearsal rooms for the local Brass band, clustered around the old Baroque church and an ancient Gasthof. Three “Generation Houses” of affordable flats for younger couples, and places for elderly people to downsize have been placed next to a large new central Bus Stop. Three important valley bus-routes connect in the village centre and the roads often had multiple vehicles double-parked, a messy situation resolved through an award-winning and very slick design completed in 2012 by three regional architects, Hermann Kaufmann, Rene Becher and Bernardo Bader. The experience of garnering attention from as humble and necessary a provision as a bus stop made an impression on the community, and after Krumbach hosted the valley’s annual Brass Music Festival in 2012, which had elated and energised the populace, a group of proactive villagers (later formalised as the “Kultur Krumbach” Association) started to meet and discuss what the village could do next. There is a regional strategy to increase bus use in the Vorarlberg, and in line with this, part of the village plan was to replace its 8 bus stops, much loved but aging designs from the 1980s by Hermann Kaufmann. With the central one already completed, residents struck upon the idea of inviting 7 well-known international architects for the other stops. As in the Handwerk+Form competition, these would be partnered with craftsmen from the local building trade, as well as with architects from the equally respected and well-developed local architecture scene. In a village of 1000 people who meet and commune regularly, and in which the 25 directly elected councillors and their nominated Mayor have substantial powers to enact local initiatives, it is very feasible to both do something crazy like this, and at the same time have businesses and the community fully behind you, but without expert knowledge of the international architecture scene they did not know with what criteria they needed to go about selecting and approaching potential architects. Dietmar Steiner, Director of the Architekturzentrum in Vienna was asked to help, and he argued that international star architects of the Zaha and Libeskind ilk would not be appropriate, as their offices were too large and the project would not receive the attention it deserved, and their styles were in any case not place-specific. Instead he sought out a group with smaller offices, who would engage in a shared project with local architects and craftsmen through a more subtle form of dialogue, and with designs through which “stories [would be] told about the relationship of the architectural object to nature, society and politics”. It didn’t matter from what country they hailed, it was their sensitivity that mattered, and excluding from the four already mentioned he invited Sou Fujimoto from Japan, Ensamble Studio from Spain, and Smiljan Radic from Chile. Aside from Wang Shu they all went to Krumbach and spent three days under the wing of Marina Hammerle, former director of the Vorarlberg Arkitectur Institut, visiting workshops, craftspeople, examples of historic, vernacular, modern and contemporary architecture, as well as meeting the people of Krumbach, and being able to select their site, which happened on a first-come, first-serve basis. Each architect fell in love with one thing or another on their trip, and incorporated their inspiration into the proposal. Radic was amazed by how the area’s public realm felt suffused with the domestic, and touching the 260 year-old low wooden ceiling of a stube, he decided to bring that intimate cosiness outside, metamorphosed into concrete and framed by glazed views of the mountains. Dagur Eggertsson was very taken with the combination of workshops specialising in the advanced use of cross-laminated wood, and on the other hand the ancient techniques still used by the famous furniture maker Markus Faisst and others with their wood-ripening houses. Ensamble Studio was enchanted with the unchanged wood-working techniques used to construct barns in the area, and wanted “to pay homage” to that tradition in its most stripped-down, elemental form. There was no fee for their work, but each was offered a holiday in the area in return, and as a rather eccentric project that would directly and measurably benefit certain sectors in the area, no public funds were used, with finance instead coming from local hotels, restaurants, individuals, and sponsorship in-kind from all the fabricators, architects, workshops and material suppliers who were in involved. Often sponsorhip came spontaneously, with the stacked-wood design by Ensamble Studio of Spain being built-up entirely by their local architects at Dietrich Unterrifaller Architects since they were enjoying, and had come to own the process to such a degree that they couldn’t let it go, and the shingles on Rintala Eggertsson Architects’ stop were voluntarily manufactured and placed in their entirety on the building by members of the village Brass Band. But they have another role, a purely joyful one that architecture rarely partakes in, namely they have become active agents in the creation of the village’s sense of itself. Through the richness of their genesis, and the unexpected ways they have been adopted, they’ve come to embody Krumbach as it is right now, looking proudly at itself and out towards to the world in 2014. As I walked around the village, bugging every other person I came across gardening in their little front yard arcadias as to whether they spoke English, a young mother beamed at me, she loved the bus stops, but “the best is our one, just there”, pointing towards Brodsky’s little tower, because she loved “seeing it when I’m in the garden”. So while I was told several times that a minority of the population were left indifferent by the whole thing, illustrated by one girl who explained that her grandmother loved them and was terribly excited by it all, but that her grandfather just shrugged and ignored it, it is the incredible enthusiasm and sense of personal ownership of those who have been aroused that is palpable, and as is the way with these things, will no doubt spread in the form of a quiet pride to the others as time passes. The people who live directly next to Radic and Brodsky’s regularly clean their stops, as if they were extensions of their front yards. Rintala Eggertsson’s stop, whose cantilevering second floor is a mini bandstand overlooking the local tennis club, has become the prime destination in which young couples meet, giving the place as Dagur Eggertsson puts it “a 3rd function, increasing the population of Krumbach.” DVVT’s folded steel, black and white abstraction of a mountainous landscape via Sol-le-Witt has been interpreted as a damn good and challenging slide by children. A villager with a keen interest in fairy-tales spent months researching stories from each country the architects came from, and held fairytale telling events in each of them. Every stop had its own topping-out party organised by the people whom it would serve, with each cluster of houses trying to outdo the others with the ingenuity of their celebrations. Sou Fujimoto’s stop, the least practical of the designs, or rather the only one that is entirely without the basic bus stop requirement of shelter, has had to have a sign placed across its stairs after a complaint that it did not conform to Austrian building regulations, which it doesn’t. I inquired quite critically after the sign, and as to the suitability of Fujimoto’s design. The mayor responded that the community had discussed the design at length, and decided to own it with enthusiasm as the symbol of their willingness towards “taking another perspective”. It is as he said “the outlaw”. It was so alien to them that they fell in love with it, it encapsulated their desire for freshness, for risk taking in their own little way. Upon seeing the design, the metalworker who was originally going to make DVVT’s triangulated structure said “I want to do this!”, which in the end of course, he did. Very well indeed. As the mayor revealed, hardly any of the bus stops in fact conform to code, because he said, if they had followed the rules they would not have been able to build any of them. Ensamble Studio’s is a climbing frame essentially, for instance. They will take down the sign in a week or so, it was only placed there to placate the police, and it can go up again and down again as often as is needed to keep the law at bay, the point being that this picture-postcard perfect village, aside from being entrepreneurial and clever, is also cheeky, ever so slightly outlaw, with a taste for a certain amount of collective madness, one embodiment of which is in the form of seven wonderful, tiny little bus stops that do not conform to building code, but are much loved, and brought me there all the way there from Soho in London. I must admit that I had gone to Krumbach with the Bilbao effect in mind, but as we drove back through the tunnel, and out into more familiar semi-urban territory of office blocks and car parks, motorways and service stations, the distance helped clarify how the village had never intended nor realized anything of the kind. Rather than a Deus ex Machina from the hands of an architectural God to divinely incur ‘regeneration’, these Bus Stops had a more limited, and yet infinitely richer agenda. They are like strange clay vessels of foreign origin, full of stories, industry, whimsy and optimism, which in their making were passed around many different hands, each leaving their mark and slowly rendering the forms profoundly familiar, which is how they now sit, beautifully routine and relaxed amongst the barns and farmhouses. As Smiljan Radic said, “Why bus stops? Do they have other problems?” “they don’t have problems… its about doing something else”, which indeed it was. A set of photos from the 7th April 2015 of my favourite of Terry Farrell's three grand projects (all of which are remarkable in their own ways) -the other two being the Mi5 Building and Embankment Place. 125 London Wall (1990-2) is a dizzyingly dense collection of articulated elements, and is by far the strangest, the most interesting and enduringly delightful of the huge volume of office projects thrown up in the period following Thatcher's big bang. It is a bridging structure built over the intersection between Wood St and London Wall, with an open-air pedestrian highwalk suspended below the office floors, above the roads, that contains restaurants and shops, and which connects the building to the Barbican, Albion House and the Museum of London. The local lending library, run by a lady whose living room is the lit window immediately behind, from where she can monitor loans, donations and notices. The Tel Aviv skyline in winter, seen from a rooftop in the?Kerem HaTeimanim. Walking from the city centre of Newcastle towards the Ouseburn river we could hear vast, echoing noises that sounded like the groanings, creakings, crackings and stompings of a ginormous animal, tearing away at some jurassic trees or the like. As we followed the curve of the bank, there was indeed something like an animal, doing violent things, tearing away at something. A tall, long, chomping pincer was eating its way slowly, methodically, through a big old concrete warehouse, the last of its kind on the grand old Tyne. The building was massive, heavy, and looked so permanent, but the demolition dinosaur was inevitably going to win as it precisely tore away chunks of floor, pulled out tangles of rebar, revealed doors, locked and unlocked, toilets, kitchens, office desks and windows in an awesome display of sped-up architectural decomposition. Architectural twins in Michelangelo's Laurentian Library Vestibule, Florence, Italy. Interior photos (from 2007) of the Palazzo dei Congressi in Rome -1950- EUR, by Adalberto Libera. 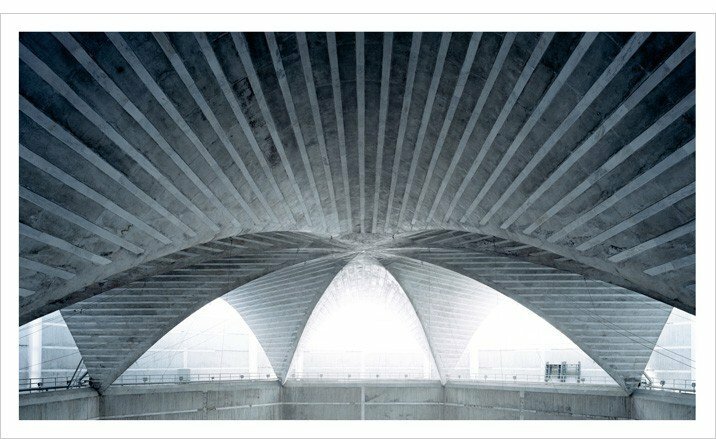 A highly complex form of temporally grounded architectural timelessness that stands with equal redolence amongst the likes of Kahn's Dhaka and Terragni's Danteum. A bouquet of buildings picturesquely clinging to each other at a junction on the edge of the Roppongi area of Tokyo, looking for all the world as if they were one discrete, hyper complex architectural composition. I saw this kind of situation happening in various places around the city, as I'd seen previously in Kobe on another holiday, but this was the most singular instance I encountered on this trip. As far as I've seen there is no such thing as a party wall in Tokyo, with buildings often separated by extremely narrow gaps of between 30 and 50cm, which for the life of my I cannot understand how people keep clean, but which they must do since they are almost always nice and tidy. These gaps, tiny plots and total lack of space mean that thin and tall 'pencil' buildings are quite common, sometimes with staggering height to base-width ratios. These buildings are however usually clustered together like commuters on a crowded train along the city's streets, or like architectural bouquets in isolated clumps-in-the-round, often in the middle of a tangle of roads. On the way to Ginza, walking through Shinbashi, I passed this singularly proud little extrusion, a typically tiny building with one room on each floor, windows on two sides, and five stories high, but here he is standing alone in the corner of a car park, only really taking up as much space as one of the cars parked around him, acting bravely as sentinel to the junction he fronts.